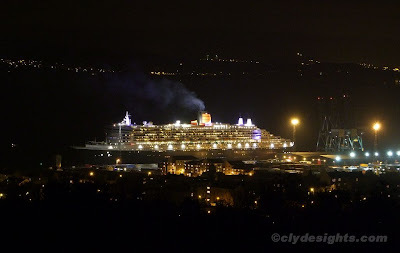 Finally, at around 1915 and more than an hour later than her original scheduled departure time, QUEEN MARY 2 broke away from Greenock Ocean Terminal and moved, completely unassisted, into the river channel. 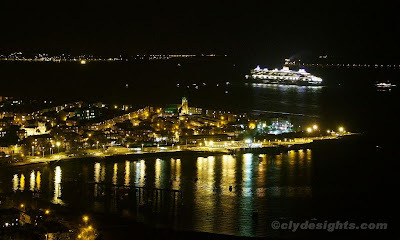 Moving slowly down the channel, QUEEN MARY 2 was accompanied by a plethora of small craft. Prominent on her port side was the preserved puffer VITAL SPARK which had arrived from Sandbank shortly before the fireworks started. 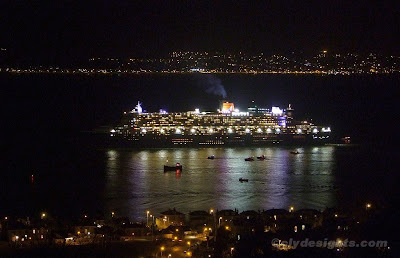 Moving past Whiteforeland Point, QUEEN MARY 2 caught up with WAVERLEY, seen ahead of the liner. 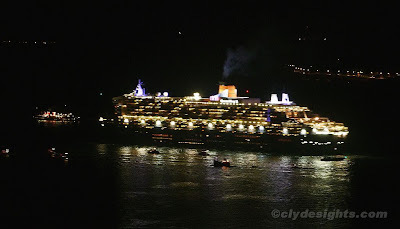 As QUEEN MARY 2 glided silently past Gourock, the escorting vessels gradually dropped back as the liner picked up speed and headed for Liverpool, the next port on her 5th anniversary Round Britain cruise. Superb shots. Worthy of posters. Wonderful pictures and well up to your usual very high standard!